Beautiful New Custom Bedroom Interior of a New Home. If there is any room in the house that deserves to be exactly what you want, it's your bedroom. The bedroom is the supposed to be relaxing, comfortable, and a reflection of your personality. 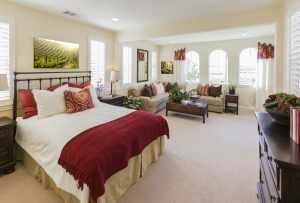 Open floor plans, comfortable niches for reading or crafting, and larger closest are all popular remodels. To get an estimate for your bedroom remodeling, call 281-789-4308 or contact us online today.